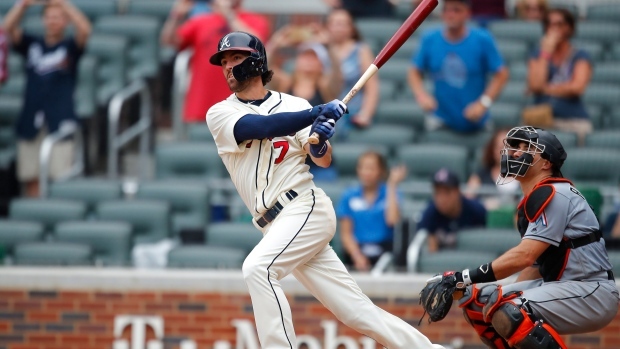 ATLANTA — Dansby Swanson struck out to begin the ninth inning, so he wanted to do something special with the game on the line after the Atlanta Braves batted around. Swanson's two-run single capped a six-run ninth, and the NL-leading Braves rallied to stun the Miami Marlins 10-9 on Sunday. Ronald Acuna Jr. drove in two runs in the seventh and another in the ninth as the Braves moved 11 games over .500 for the first time since July 5, 2014. Atlanta has won nine of its last 12 and keeps performing well in the clutch with an NL-best 88 runs scored this season in the seventh inning or later. "I almost expect 'em to do it," said manager Brian Snitker, whose club has 43 victories in its last at-bat, most in the majors, since he took charge on May 16, 2016. "I mean, down six in the bottom of the fifth, I felt good. I really did. I thought that these guys have a lot of time to go to work here and then you get a little bit farther away, but they never stop. It's a great win for these guys." Miami led 6-0 after four innings and 9-4 to begin the ninth. Lewis Brinson's first career grand slam highlighted a six-run fourth, and Miguel Rojas homered twice and drove in four runs for the last-place Marlins, who have lost three of four. Atlanta started the ninth with three runs off closer Brad Ziegler on Acuna's single, a throwing error by first baseman Justin Bour and a single by Nick Markakis. Taylor Guerrero (0-2) came on with two outs and allowed four straight batters to reach base. He walked Tyler Flowers, gave up an RBI single to Kurt Suzuki and walked Johan Camargo, who became Atlanta's everyday third baseman earlier Sunday when the Braves released Jose Bautista. Facing Swanson, Guerrero threw seven straight fastballs — all in the upper 90s — before the No. 1 overall draft pick of 2015 laced a single down the left-field line to touch off a celebration in the outfield. "I just came to do my job and while today wasn't a good day to do that, I'll take the experience to take the next opportunity and do my job," Guerrero said. A.J. Minter (3-0) allowed Rojas' homer in the ninth but benefited from the rally. Julio Teheran dug the Braves a hole in the fourth by balking in a run and hitting two batters before allowing Lewis Brinson's first career grand slam. Teheran allowed six runs in the frame, matched the second-worst inning of his eight-year career, and he has a 6.29 ERA over his last six starts against Miami. Teheran allowed seven hits and three walks while striking out four in five innings. He had won four straight decisions and had a 2.20 ERA over his previous seven starts. Wei-Yin Chen allowed just two baserunners before four straight singles made it 6-2 in the sixth. The left-hander gave up five hits, one walk and struck out five in 5 1/3 innings and has a 3.00 ERA in his last six starts against Atlanta. Acuna's two-run single off Drew Steckenrider cut the Marlins' lead to 8-4. Marlins manager Don Mattingly knew his team wasn't entirely safe entering the bottom of the ninth. "They're at the back end (of the lineup), but you know if they roll it around, you know what happens," Mattingly said. "You could be in some trouble." Braves: CF Ender Inciarte stayed in the game for a while after slamming into the wall in the fourth. As Bour's triple sailed over his glove, hit the wall and bounced away, Inciarte's right shoulder hit the wall and he dropped onto his back, staying down for a couple of minutes while play was stopped. Snitker and a trainer visited Inciarte as he was helped to his feet, but the manager replaced Inciarte in the field before the start of the seventh. "The shock wore off, and he got sore," Snitker said. "I wanted to get him out of there. I think he'll be fine tomorrow." General manager Alex Anthopolous said the decision to release Bautista was made before Saturday's 8-1 win. The 37-year-old Bautista, signed to a minor-league deal in April, joined the Braves on May 4 and hit .143 with two homers and five RBIs in 12 games. Camargo went 0 for 3 with two walks on Sunday. Bour hit the Marlins' last grand slam on June 19, 2017 against Washington. Teheran last gave up six in an inning on May 26, 2015, at the Los Angeles Dodgers. He allowed a career-worst seven runs in an inning at Philadelphia last July 28. Derek Dietrich grounded into a forceout in the seventh but advanced to third on throwing errors by first baseman Freddie Freeman and second baseman Ozzie Albies. Rojas then homered off Lucas Sims to make it 8-2. Rojas' homer in the ninth was his seventh this season and gave him his first career multi-homer game. Before this season, Rojas had four homers in 358 career games. Marlins: RHP Elieser Hernandez (0-0, 2.25 ERA) will make his second career start as Miami opens a three-game series at the New York Mets. He allowed one run and four baserunners in five innings against the Dodgers last week. Jason Vargas (0-3, 13.86) rejoins the Mets' rotation after three ineffective starts. Braves: RHP Mike Foltynewicz (3-2, 2.87 ERA) will make his 10th start and 75th of his career as Atlanta opens a three-game series at Philadelphia with a 1 1/2-game lead in the NL East over the Phillies. He is 4-2 with a 3.74 in nine career starts and one relief appearance in the series. Nick Pivetta (3-2, 3.72) starts for the Phillies.